Taulman3D has now released its low temperature, high strength industrial t-glase filament line into the desktop 3D printing community. T-glase, which is short for tough glass, is a specially engineered high strength industrial 3D printer filament for users that print with PLA or lower temperature desktop 3D Printers. Taulman t-glase is derived from the strongest PETT polymer combination available in the market. As t-glase is part of the Taulman3D family you can be sure that t-glase is a strong material! Where Taulmans 618 and 645 nylons are quite bendable, t-glase is however a fairly stiff material. When it comes to stiffness/bendability t-glase is more comparable to ABS and PLA, rather than to Taulmans 618 and 645 nylon filaments. Taulman t-glase filament comes in a clear colour, as clear is the natural colour for this type of polymer. When summarising above features the conclusion is that Taulmans t-glase filament is a very clear and tough material and also quite light. Like PLA filament, t-glase is printed at lower temperatures. 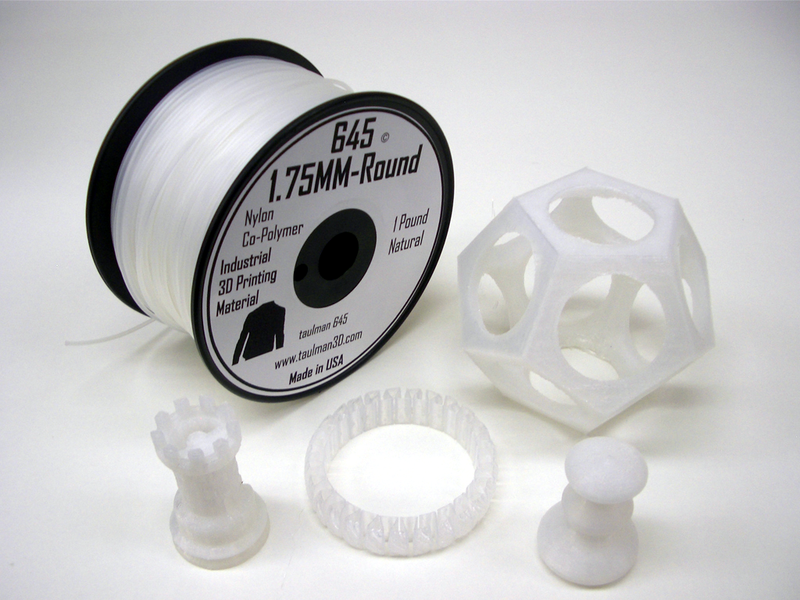 The optimal printing temperature for printing with t-glase filament is about 212°C to 224°C. However it will print down to 207°C and up to about 235°C. T-glase prints easily to acrylic, glass, Kapton and other platforms. It has excellent bridging features and has very little to zero warpage, which makes it an excellent material for printing large objects. Also nice to know, t-glase prints without any odors or fumes. 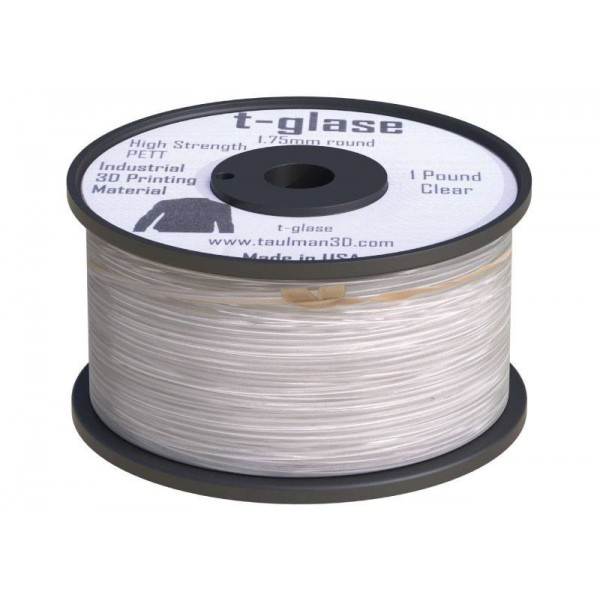 T-glase filament comes on a spool with approximately 450 grams of filament wrapped around it and is available in 1.75mm and 3mm diameter. There are no odors or fumes when 3D Printing with t-glase. Note: currently Taulman T-glase measures 1.76mm to 1.83mm dia in a slightly oval shape due to the draw and cooling process. The line cross section is constant, however users should make a slight adjustment to their "Material Diameter" (1.78mm - 1.80mm) settings to accommodate this slight variance. Our Taulman t-glase 3D printer filament is wrapped on a plastic spool which contains approximately 0.45Kg of filament. Our Taulman t-glase filaments are packed in a silica sealed bag. Please see below some more details with respect to the weight and dimensions of our Taulman t-glase filaments.